Q: What DON’T you do when your data values are not mutually exclusive? A: Present your figures as percentages. Ok, so a joke like that isn’t going to be getting many laughs – if you can think of a better data vis wisecrack I’d love to hear it – but it might elicit a few groans of recognition. The above illustrates a fairly common data visualization mistake, and a recipe for a devastatingly confusing chart. This is the trouble that the creators of the now semi-legendary “How do Baby Boomers Describe Themselves” chart ran headlong into. 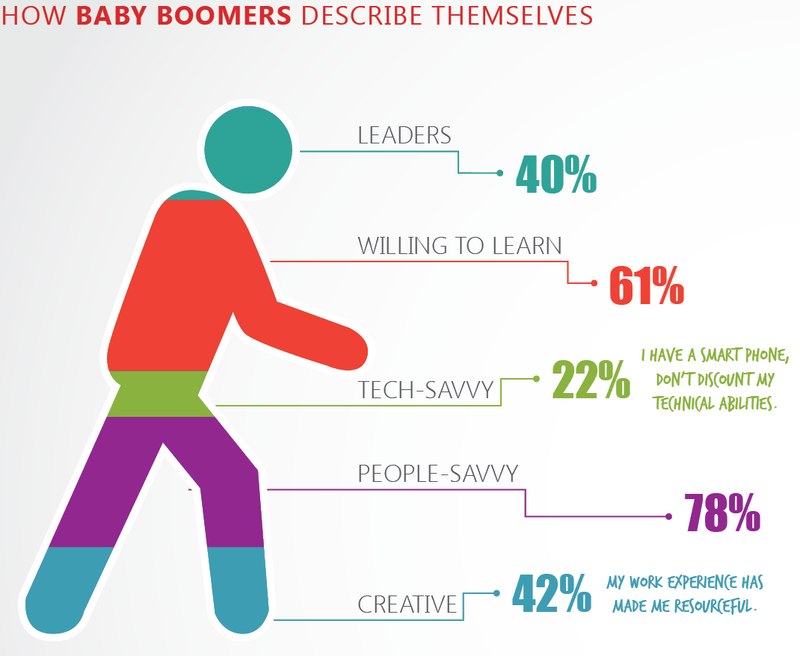 They created a chart based on five common adjectives that a baby boomer might use to describe his or herself – these adjectives were ‘leader’, ‘willing to learn’, ‘tech-savvy’, ‘people-savvy’ and ‘creative’. The problem is, the creator did not make the data values exclusive. Responders were free to choose any number of words which applied to them. This is fine, of course, as long as your visualization technique reflects this style of questioning. Presenting a group of independent values as portions of a whole simply looks bizarre, particularly when your values add up to 243%, and the 61% portion is bigger than the 78%. So yes, this is an example of how not to do data visualization. Let’s have a look at a few more. Data has a habit of being pretty complex. This is why we use data visualizations to present information to the public, or to draw attention to certain points within the data. With this purpose in mind, a highly complex or visually baffling piece defeats the object of creating a visual in the first place. This represents another one of the many balancing acts a visualizer must undertake. Of course, we must treat the users of our content with respect, granting them the considerations they deserve, and we must not patronize and condescend these users, or dumb our content down. But the flipside of this is insight. We are dealing in convenience, delivering insight to content users in a manner which makes them approach the data in a differently to how they may previously have considered. What’s the point of creating a visualization if it has no insight? This is just data presentation, and the user may as well just look over the facts and figures themselves. We need our visualizations to be striking, and we need them to connect directly with the figures and become extensions of the data itself. One way to achieve this is to use symbolism, to draw upon images that represent the figures in some way. In fact, this is not bad practice at all. In fact, it is very useful in achieving the sort of cohesion, relevance, and relationship between data and visual that should always be our goal. However, it is possible to go too far. Let me explain. Imagine you need to make a visualization examining the sugar content of different pieces of fruit. A visualization of this type requires comparable data points that show a user straightaway which pieces of fruit contain the most sugar per portion, so you decide to represent this using images of each fruit. This is going to cause problems straight away. A bunch of grapes has a very different make up to – say – a peach, so it becomes difficult for a user to define the relative size of the grapes compared with the peach. You might try to get around this by representing the percentage of sugar content in each piece of fruit, but the user’s eye is still going to be drawn to the relative sizes of each image. The conundrum that this creates is something of a minefield for visualizers. We want to encourage this sort of visual connection with the figures we are working with, but we cannot let this get in the way of the data itself. Sometimes, it is best to just return to the drawing board and create imagery which is light on symbolism, and heavy on genuine, demonstrable insight. Ahh, the old “visualizing for visualization’s sake”; a trap which all of us have fallen into at some time or another. The truth is, with so many great tools and gizmos at our disposal, all of which are just waiting to be used in creating a stunning piece of visualization, it can be tempting to go overboard. We receive data, we take a look at the tools we have to play with, and we whip up a smart looking visual ready for use; but is this visual really adding anything to our content? Are we representing something which could be better presented in another way, or even with simple text? A data visualization must always provide another element to content, something which would be difficult to illustrate using basic text. Its structure and format must be linked directly to the data at hand, illuminating insight in a highly effective way. All of this needs to be considered before a visualization is created. Be critical and be harsh; if your content will not be enhanced by a visual, hold fire until next time. A good visualization should be able to stand on its own, delivering a level of insight to a content user with little or no context. However, a great visualization will always include a little contextual information of its own, augmenting the insight and benefit the user receives. This information ranges from the minimal – labelled axis on a chart, for example – to the more heavyweight; such as an extended article or other media to give the user the necessary background. We must always ensure that such context is presented. By passing the visual on to other people to take a look at – people not involved in the creation of the imagery – we can make sure that we are producing visualization which strikes the perfect balance when it comes to context. No one wants to produce a data visualization horror show. By considering the data, our audience, our medium and the narrative we want to create, we can safeguard ourselves against the nightmare of messy, confusing and misleading data. Next articleWhat Exactly is Visual Storytelling?